I have been waiting for this news for a while. The day I can put my rubbish out the night before without every single dog and cat (including my two cats) raiding it will be one of yay. Aucklanders will soon be using three bins: one to recycle, one for food waste and one for landfill. Papakura will be the first area in the Auckland region to get a new-three bin rubbish collection service, and the first large-scale area to get a food waste service. 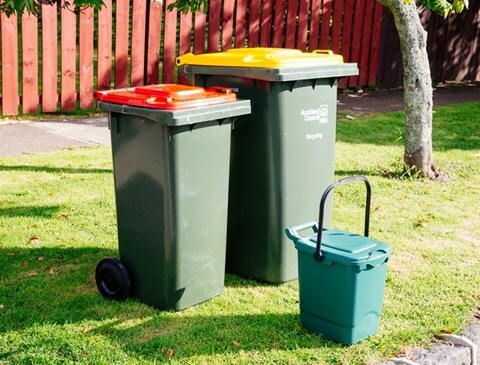 The Environment & Community Committee agreed yesterday to start the region wide rollout of the three-bin service, beginning in Papakura next year and expanding to all urban areas of the region by 2020. What would a three-bin system look like? Already we are using recycling bins for all of our recyclables. However, currently 45 per cent of household waste that makes its way to landfill is food waste, which can be diverted and treated separately. Auckland Council will add a much smaller food waste bin, which would be collected weekly, so we can separate our food waste and ensure it does not go to landfill. The new rollout will also include a new rubbish bin. This will replace rubbish bags in the north, west and parts of the south. The central and south areas would retain their existing bins, and all will be emptied on a pay-as-you-throw basis. Councillor Penny Hulse, Chair of the Environment & Community Committee, says moving to a pay-as-you throw model will incentivise us to send less waste to landfill. “Already in parts of the region, people pay for rubbish bags, so in that sense, there is little change for those households,” she says. “People will really notice the change with the food waste collection. If people are using the food waste bin, and recycling correctly, households will be putting even less waste in their rubbish bin, and therefore paying less for their rubbish collection as they will use it less often. Manurewa-Papakura Ward Councillor Daniel Newman says the decision is a great step for Papakura. “Papakura has been waiting a long time to move from orange rubbish bags to a wheelie bin service, and our community is a great place to begin this region-wide rollout. A recycling bin for household plastic containers, paper, cardboard, cans, tins and glass containers, which is already used around the region. This is paid for by your rates. A food waste bin, for all household food waste, that is also covered by your rates. A pay-as-you-throw rubbish bin. A choice of bin sizes and payment methods will be available. The rollout will begin in Papakura in early 2018, and be offered region-wide by 2020. The payment system for the general refuse bin (recycling and food scraps bins paid for out of the waste management component of your Rates bill) will be pay per lift. How that pay per lift is done (tags or bar code) and at what price is still to be worked out. None-the-less switching to bins and the incentive to recycle and compost will me less crap going to the landfill.